A 4 1/2 day circuit walk in the Bogong High Plains, Victoria, Australia. Start at the west end of Rocky Valley dam wall. Follow the road to Pretty Valley dam, continue on the Fainter fire trail to Tawonga huts, you can camp here but I recommend going 3km more north to Little Plain to camp as it puts you in striking distance of the two Mount Fainters, do the Fainters that afternoon or next morning. 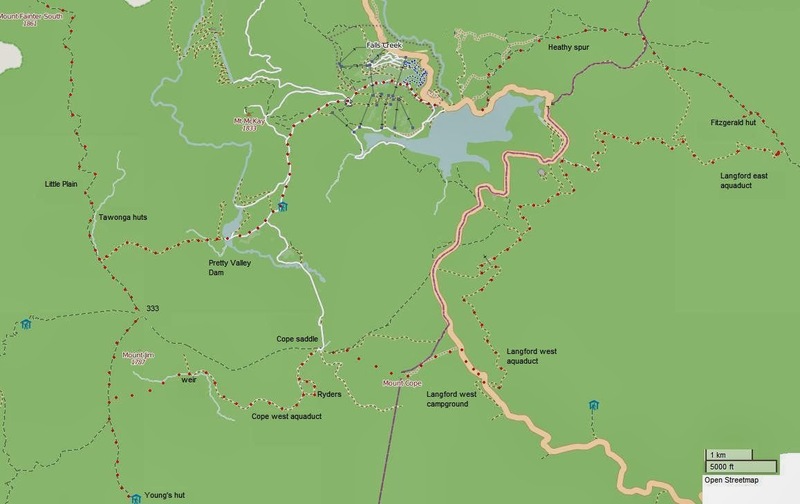 There is also a track up to Mt Jaithmathang (on some maps Mt Niggerhead) from Tawonga huts. Go back 1 km south from Tawonga Huts on the Fainter fire trail then follow the pole lines through pole 333 to Young's hut. Follow the aqueduct northeast to its end near Fitzgerald's hut, turn left at the end and go 1km uphill to the hut. Follow the pole line west, then take Heathy spur track back to the start. Typically, the weather is 10C cooler than Melbourne. You can check Falls Creek Vic. weather. Summer weather is very pleasant but you should be prepared for wet and cold weather any time of the year. Carry a map and compass and walking and camping gear suitable for wet cold weather. There is abundant water in many springs and creeks which many people are happy to drink untreated. Particularly if arriving from overseas, please check boots, socks, packs and tents for any seeds. This unique ecosystem is already under serious threat from hawkweed, introduced by accident from Europe.